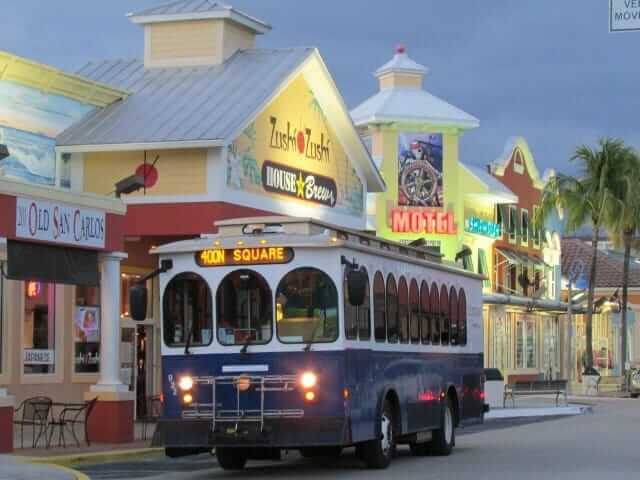 The Fort Myers Beach Trolley services the Island with stops all along the beach! There are two trolley routes servicing the beach as well as the free beach tram. 490 ROUTE: runs from the Beach Park & Ride facility on Summerlin Square Dr. to Times Square. 410 ROUTE: runs up and down the beach from Bowditch Point Park to Lover’s Key State Park. FREE BEACH TRAM: runs every 20 minutes seven days a week from Bowditch Point Park to Matanzas Pass Preserve. The Trams are ADA accessible and can carry one mobility device. Click here for a timetable and map for all three routes. Stops for the trolley are indicated by the blue and white ‘Trollee’ signs on San Carlos Blvd. and Estero Blvd. It’s free to park at the Beach Park & Ride and the Trolley only costs 75 cents a ride, $2 for an all-day pass or $4 for a 3-day pass. Be sure to have the exact fare as the drivers CANNOT make change! The Beach Tram is FREE. Discounted fares are available to seniors aged 65 and older, persons with disabilities and full-time students. To receive the discount fare you must present either a medicare card or LeeTran photo I.D. every time you board. To obtain a LeeTran photo I.D. bring proof of disability, age or student status, plus one form of photo I.D. to to the Rosa Parks Transportation Center, 2250 Widman Way, Fort Myers. Cost is a one time fee of $1. The discount fare for the trolley is 35 cents. The Trolley can carry bicycles using racks on its exterior. The Transit app includes real time bus tracking and will help you find the nearest stop for the trolley. Click here to download the app. For more information on Lee Tran’s other bus routes visit their website.